Reporting from the World Energy Innovation Forum at the Tesla factory in Fremont, Calif., hosted by Tesla investor and Partner at Technology Partners, Ira Ehrenpreis. As GTM's Stephen Lacey has reported, six years ago, Elon Musk was on the verge of losing most of his fortune. But today Musk (the fourth CEO at the firm) is holding court at his sprawling and bustling factory that is celebrating the success of Tesla and the adolescence of the cleantech industry. Tesla stock is up big since the start of the year and 92 percent of America's new energy capacity in the first quarter of this year came from renewables, according to Ira Ehrenpreis' opening remarks. Ehrenpreis described Elon as an engineer, but said that "his skills as a builder go far beyond the products." Musk is "an engineer of society and the world," and "engineering is his toolbox." Ehrenpreis added, "In his worldview, failure is not an option." Musk noted that he sold his first video game at age 12 and spent much of his childhood reading or playing video games. As for being able to work in a wide range of disciplines, Musk said the secret was "reading books" and "talking to people." He also asked, "How much of your job did you learn at college?" Then he provided the answer: "Not much." Musk said that the internal combustion engine is "kind of a ridiculous kludge" that "needs an electric motor just to start -- that's a silly architecture." It's a "testament to engineering that an ICE can run reliably." He compared an ICE to a "bobblehead doll" with "a huge engine block up high on rubber mounts." Musk noted the inherent low center of gravity of the Tesla S that makes Newton an ally. Musk once again dismissed fuel cells, saying that lithium-ion battery performance today is better than the theoretical best performance of fuel cells. Musk also spoke of "designing from the ground up," adding, "people insist on reasoning by analogy" instead of first principles. He said that he wanted to show what EVs can do with the Model S and didn't want to crowbar an EV drive train into an ICE glider. He noted that the Tesla Roadster suffered from that mistake. It turned out that using the Lotus body was "a big mistake" and the finished model ended up having only 7 percent of its parts in common with the Lotus. We "should have designed that from the ground up," said Musk, adding that the technology licensed from AC Propulsion did not work in a production environment. "He has a vision so big and bold and a tenacity that sets him apart from anyone I've worked with," said Ehrenpreis, also characterizing Musk as having the ability to "uncover hidden talent" and combine a profitable business with a "higher calling." He also said that there is "so much more to come from Elon." Musk told the 750 people in the audience that after driving a Tesla,"a gasoline car is not as good as you remember." 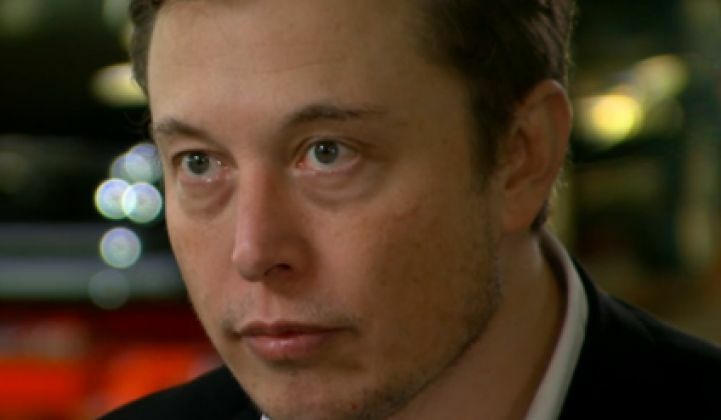 Here's the recent 60 Minutes story on Musk's entrepreneurial saga. You can also read our latest on Tesla's plans for a Giga battery factory here.